Though New York City is indeed a melting pot with a hodgepodge of restaurants featuring cuisines from all over the world, Portuguese restaurants do not abound, unfortunately. New spots have propped up breathing new life into Portuguese options in the Big Apple, like George Mendes’s Aldea and Chinese/Portuguese fusion Macao Trading Co. Others like Pico came and went, and few have stood the test of time like Pão. When in the late ’90s Alfama opened its doors in the West Village, I was sure it would be one of those Portuguese restaurants that would stand the test of time, but after a successful 10–year run it closed its doors over an unexpected rise in rent. I was stunned and saddened, recalling my memorable first dinner at Alfama. It had just opened and my boyfriend Paulo (now husband) and I wasted no time in making a reservation. That winter night bundled in our thick coats and scarves, we crossed the Holland Tunnel from New Jersey and as we stepped out of the car snow began falling. Yes, just like in romantic movies. The restaurant was splashed in blue and white, the signature color combo customarily adorning Portuguese tiles or azulejos. It was quaint inside and the menu authentic, yet contemporized with dainty versions of shrimp stuffed turnovers or rissois, which we ordered to start. For my entrée, I had Frango Na Pucara, chicken prepared and served in a ceramic pot. Fado played in the background tying back to Alfama, the historic Lisbon district the restaurant is named for and which is often the theme in Portugal’s national song. It was also at Alfama where now world-renowned Fadista Mariza first launched her album to the New York market. It all made sense. What didn’t make sense was when two years ago, I heard from the restaurant’s manger Denise Costa, co-owner Miguel Jerónimo’s niece that the restaurant would close. This spring she served up the good news that Alfama would reopen in Midtown East. It wasn’t easy to imagine Alfama anywhere else, given the warmth and quirkiness of the West Village nabe, that the restaurant seemed to be organically part of. But when I heard Alfama was finally open, Paulo and I once again made a reservation. This time it was a spring night and instead of the Holland we crossed the Henry Hudson Bridge from Connecticut. The restaurant hadn’t even received its liquor license yet or held its official grand opening, but we grabbed a bottle from our home rack—2004 Esporao, blend of Trincadeira, Aragonez, Cabernet Sauvignon, Alicante Bouschet—and made the trip down anyway. There it was Alfama written in white on royal blue awnings once again, but in a modernized space. I set nostalgia for the old location aside and opened the door. Denise, who was surprised to see us, guided our grand tour of the now bi-level restaurant and explained that they were still working out the kinks. But we felt at home and none of that bothered us. We were happy it was back. The new restaurant, in line with its muse Lisbon, is a mix of modern and classic Portugal. It has ditched the formal white linens that once donned its tables for honey-hued wood with hints of the Old Country peppered throughout. There’s a blue and white tile reproduction of the Alfama district hanging on the wall brought over from the former restaurant and there are ceramic pots on shelves, but the most impressive piece of décor is a floor-to-ceiling mirrored map of Portugal during its heyday. In addition to the bar and dining area, there’s a somewhat hidden private room behind the bar and on the lower level diners can eat while peering into the kitchen. In this area, Alfama plans to organize Fado nights. Chef Francisco Rosa has been transplanted from the former Alfama offering staples like the seafood stew and fillet mignon grilled on a stone. But he has added a bevy of new options, too, with a concentration on small plates called “Petiscos” in Portugal and with influences from the country’s former colonies, such as Brazil, Goa and Macau. Selections include chicken gizzards in a savory tomato sauce, rabbit meatballs with sage and fried lupine beans. The restaurant is also betting on Rosa’s artisanal basket of breads and delectable desserts, including the ever-popular Portuguese custard tarts. We ordered the shrimp turnovers with arugula and rabbit meatballs to start. The turnovers were oozing with flavor sealed in with a fried shell. The meatballs were smothered in savory, semi-sweet gravy that we could have had as a soup. For my entrée, I couldn’t resist the Portuguese style barbequed Piri-Piri chicken served with fries and salad. It’s a simple dish that may be a bit hot for most, and though I generally have a low tolerance for overly-hot food, I find Piri-Piri to have the right amount of heat and sweetness. For dessert, we ordered Rosa’s version of Sericaia. It was heavenly! Imagine the lightest, fluffiest pancake you ever put in your mouth. It was a lovely night. We returned in June for the restaurant’s official grand opening. 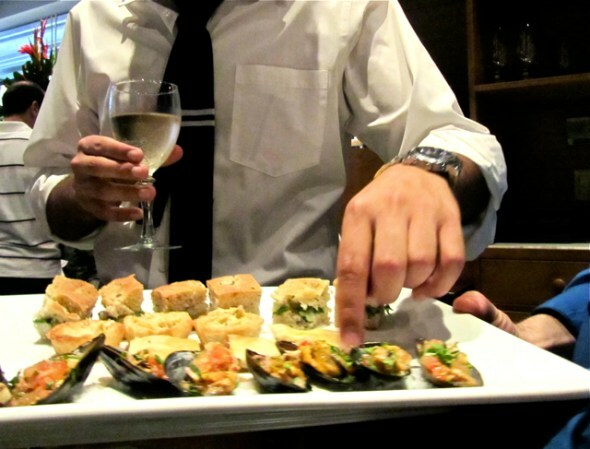 Bite-sized versions of menu items were passed around as supporters mingled and sipped wine. 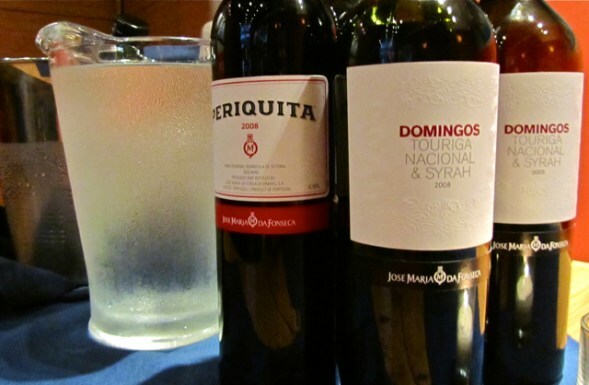 Co-owner Tarcisio Costa, also the sommelier, selected reds, vinho verde and moscato white by Setubal-area winery Jose Maria da Fonseca: Periquita 2008 (Tempranillo, Castelao and Trincadeira) and Domingos 2008 (Touriga Nacional and Syrah); Twin Vines 2009 vinho verde and Lancers Moscato white. Tarcisio’s wine list, not yet posted online, will lean towards Portuguese wines but with a nod to other dots on the globe, like New Zealand and South Africa. He also plans to showcase Hungarian wine in homage to the Hungarian Society that neighbors the restaurant. And, he’s responsible for the inventive cocktails on the menu also popular at the original restaurant, which include the Alfama Martini—a mix of Ketel One, white Port and lemon peel. That night, I had the chance to steal Tarcisio away for a quick chat. I asked what it meant to him and his clan to have Alfama operating again. He said it’s their mission, their work and their love. It’s to promote Portugal. We couldn’t agree more, so if you’re keen for a personal visit of Lisbon’s Alfama neighborhood, or are craving a customized food and wine tour of Portugal, let us know! We’d love to show you the Chef’s personal stomping grounds up close and personal.